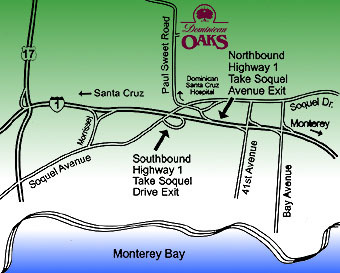 From Santa Cruz: Take the Highway 1 exit marked "Soquel Drive," the next one after "Morrissey Boulevard." Stay right, cross the freeway on the overpass and turn left at the first traffic light onto Paul Sweet Road. Drive past Dominican Hospital and look for the Dominican Oaks sign on the right. 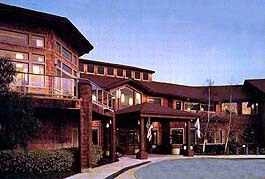 From Watsonville: Take the Highway 1 exit marked "Soquel Avenue," the next one after "41st Avenue." Turn left at the 'T'-shaped intersection onto Commercial Way. Go straight at the traffic light, cross Soquel Drive and you'll be on Paul Sweet Road. Drive past Dominican Hospital and look for the Dominican Oaks sign on the right.